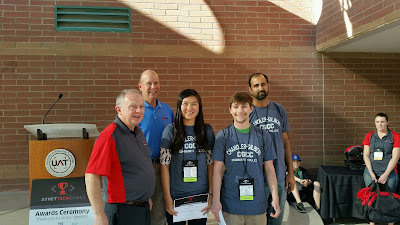 Two computer science students from Chandler-Gilbert Community College won first place at the 11th Annual Avnet Tech games on Saturday, April 2nd at the University of Advancing Technology in Tempe. Alec Everson and Lining Lin each received a $1,000 scholarship for their “Java Bliz” competition entry. Both students developed an IT application using Java code, the dominant software development language in the market. The Avnet Tech Games is an annual technology competition that provides college students with an opportunity to win scholarships by applying what they learn in school to real-world IT business scenarios. This year students competed for $34,000 in scholarships. Students also connected with IT professionals and learned more about what it takes to succeed in today’s highly competitive business market. Careers in STEM fields are full of opportunities. According to the Bureau of Labor Statistics, 8.65 billion jobs will be needed in STEM-related fields in the U.S. by 2016. In addition, STEM workers receive 26% higher earnings than their non-STEM counterparts. In total, 27 students from 12 Arizona colleges and universities were awarded scholarships and nine faculty advisors received $2,700 in honorariums for leading the winning teams to victory. The participating schools included: Arizona State University, Chandler/Gilbert Community College, Embry-Riddle Aeronautical University, Estrella Mountain Community College, Glendale Community College, Grand Canyon University, ITT Technical Institute, Mesa Community College, Northern Arizona University, Scottsdale Community College, South Mountain Community College and The University of Advancing Technology.